Yesterday we did some great after-Christmas shopping. It was also my roommate's birthday - he's 28! Happy Birthday, Jeff! We went to Kohl's and Home Depot - both VERY effective. At Kohl's, I went looking for a toaster. Now with the Keurig, we have a few stainless appliances on our counter and I just wanted to get rid of our $7 white toaster haha. We found a great one [a $60 Food Network floor model for $20]! We also got some tea and hot cocoa k-cups for the Keurig - all on sale AND a steam mop. If you haven't seen or tried these before, you really should. They are so easy to use and clean [and there's no waste like swiffers because you throw the pad through the washing machine]. I love Kohl's and their 20% off coupons... and old roommates whose mail still comes to our house. All in all, saved tons of money! 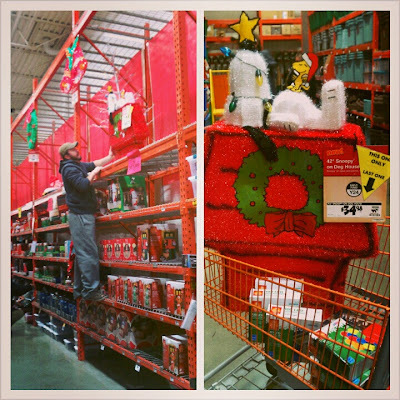 Then at Home Depot, we went looking for 50% off Christmas lights. We do this every year, and they are such great deals. LED lights are fantastic and save on electricity, but they can be expensive. We got more icicles to do our shed next year and tons of colored lights to line windows and do more bushes next year. Home Depot also had the Snoopy lawn ornament I've been gawking at since Thanksgiving. However, I couldn't bring myself to spend $70 on it because we are so lucky to get so many hand-me-down from Jeff's parents. I was even hesitant when I saw the floor model marked down today for half off because it's been on in the store for over a month. I was worried that the lights might need to be replaced early next year, but my roommates ensured me they could handle it. Soooo, Jeff got it down for me [because we couldn't find anyone to help us haha]. Now here's the best part, we went to check out and Mike asked twice if the guy wanted the bar code for Snoopy. He shrugged him off said he would do it at the end. We were joking with him about how silly it was to buy Christmas stuff now, and before we knew it, he told us what we owed and Mike paid. It was about 5 seconds later that we looked at each other and realized he didn't ring it in. Look at the photo above this, how do you not see it in the cart?!?! We aren't sure if he was just so busy that he forgot or if he just wanted us to have the floor model. Either way - free lawn ornament!!! And of course, it was promptly put out front!! Don't worry, Mr. Home Depot Man, it went to a great home! Of course, the night was finished off with lots of snow and a few beers [or hard ciders, in my case] out for Jeff's birthday! Alright, so here are the before and after photos of our kitchen and our updated front lawn!